Our company provides high temperature and high pressure multi-stage noise reduction electric control valve (GKV1600H-1500LB-2”),high temperature and pressure hydrophobic shut-off valve is perfect applied to 2 × 300MW steam turbine and thermal power generating units of the soot blowing system in eighty-one Power Plant in Xuecheng district, Zaozhuang City, Shandong Province. a. Loop convection labyrinth disc cross-sectional area of the outlet size and cross-sectional area of the outlet size are the same, large particles do not go in, the small particles are not stuck in the internal flow channel. b. The flow path within the annular disc, no dead corner, and guarantee no accumulation of impurities, lead to long blockage. 2. Anti-erosion: After a loop convection labyrinth disc element multi-stage step-down reduction, flows through the sealing surface speed control in the liquid 20-30m/s, gas 80-100m/s. 3 Low noise: Fluid after disc multistage depressed deceleration, and velocity of the fluid flowing through the valve orifice disc is reduced, while also reducing fluid noise. 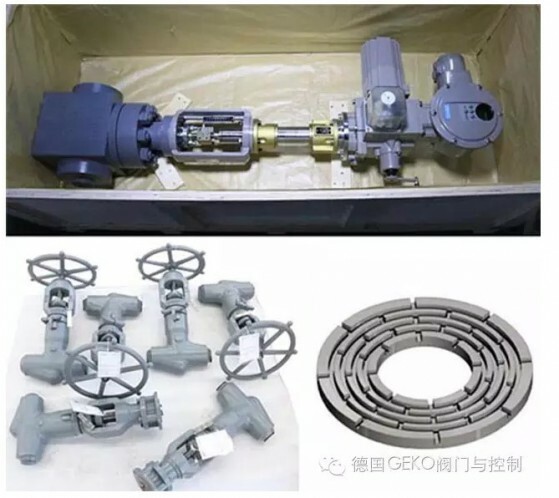 Main applications: Feedwater pump outlet loop valves, Boiler feedwater control valves, Cooling water control valves, Boiler continuous and intermittent discharge drain valves.